Bring something cozy to sit on and dress in layers, it can get cold. Robert Crouch is an artist and curator whose work encompasses sound, performance, and technology. As an artist, he locates his work with the intersection of post-phenomenological listening practices, conceptual sound art, and contemporary electronic music. At its core, his work can be understood as a conversation between tonality, context, history and subjectivities. Similarly, Crouch’s curatorial work focuses on the overlapping disciplines of sound, technology, movement, and performance. In 2014 he organized the North American premiere of Sphæræ, a large-scale inflatable performance space and public artwork by Dutch artist Cocky Eek. In 2017 he co-curated Juan Downey: Radiant Nature, a survey of early interactive and performance work of the late Chilean artist as part of the Getty initiative, Pacific Standard Time: LA/LA. Crouch is the former Associate Director/Curator at LACE, where he curated solo exhibitions with artists Karen Lofgren, Gina Osterloh, Steve Roden, Sean Sullivan, and Margo Victor, and performances with artists including William Basinski, Celer, Lawrence English, Dominick Fernow, and Yann Marussich. He is also the founding partner of VOLUME, a curatorial project that functions as a catalyst for interdisciplinary new media work through exhibitions, performances, events, lectures, and publications, and has worked with a wide range of artists including William Basinski, Nate Boyce, Frank Bretschneider, Richard Chartier, Heather Cassils, Celer, Loren Chasse, William Fowler Collins, Tim Hecker, Isis, France Jobin, Kadet Kuhne, Lucky Dragons, Mamiffer, Carsten Nicolai, Yann Novak, taisha paggett, Steve Roden, Terre Thaemlitz, Julie Tolentino, and Christopher Willits. Crouch is currently the Executive and Artistic Director for Fulcrum Arts and the Artistic Director for the AxS Festival. Robert Crouch is published by Touch Music. 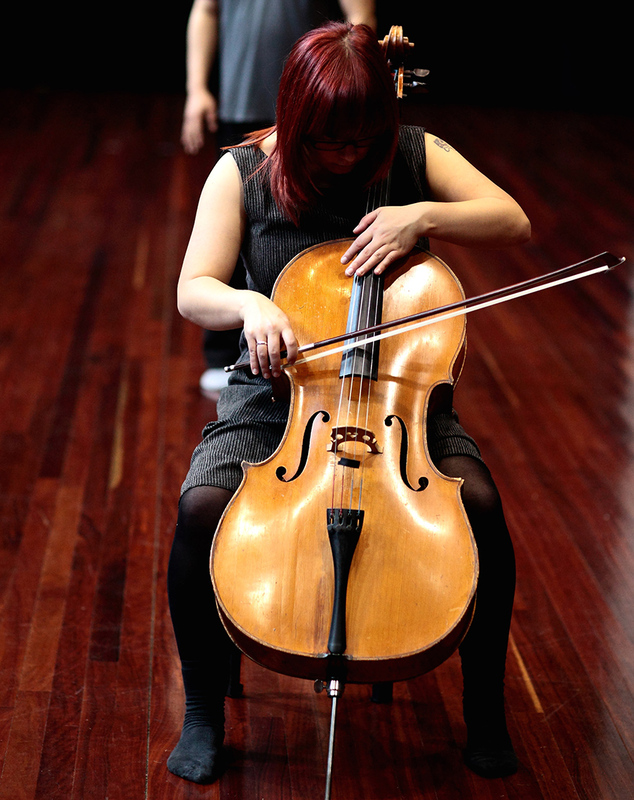 Judith Hamann is a cellist from Melbourne, Australia. Her performance practice stretches across various genres encompassing elements of improvised, art, experimental, and popular music. Currently her work is focused on expressions of immersion and saturation: explored through durational, spatialised and electroacoustic approaches to sound, as well as an examination of psycho-physical materials and manifestation of 'shaking'. Judith has studied contemporary repertoire with cellists including Charles Curtis and Séverine Ballon, as well as developing a strong practice in improvisation and sonic arts through collaborative projects both in Australia and internationally. She has worked with artists and ensembles including Oren Ambarchi, ELISION ensemble, Dennis Cooper, Arnold Dreyblatt, Maya Dunietz, Jürg Frey, Graham Lambkin, Alvin Lucier, Sejiro Murayama, Toshimaru Nakamura, The Necks, NYID, Michael Pisaro, Ilan Volkov, Tashi Wada, and La Monte Young. Judith is a member of Golden Fur, Hammers Lake, SYSTEM (with Anthea Caddy), The Argonaut String Quartet, and a duo project with Rosalind Hall. She has performed widely with festivals including Tectonics (Glasgow, Adelaide, Tel Aviv, Athens), UnSound (NYC), Musikprotocol (Graz), The Now Now (Sydney), BIFEM (Bendigo), Dark Mofo (Hobart), Tokyo Experimental Festival, SiDance Festival (Seoul), and Liquid Architecture (AU). Other performance highlights include improvised or repertoire presentations at Cafe Oto (London), Issue Project Room (NYC), Dia Art Foundation (NYC), Steim Institute (Amsterdam), Logos Foundation (Ghent), LaSalle University (Singapore), SuperDeluxe (Tokyo), O’ Gallery (Milan) and Tempo Reale (Florence). Sophia Shen is a composer, sound artist, pipa performer/ improviser and pianist who believes in the subjective, evocative, conceptual and ineffable nature of music and sound. She makes intangible connections with performers and listeners by creating music that evokes memory and imagination. She is interested in bridging the divide between cultures by using instruments to dissemble and synthesize new sounds. Sophia is currently based in the San Francisco Bay Area. She holds an MFA in Electronic Music and Recording Media from Mills College where she also studied composition and improvisation. She received a BA degree in Music with High Distinction and a BA degree in German from the University of Virginia.